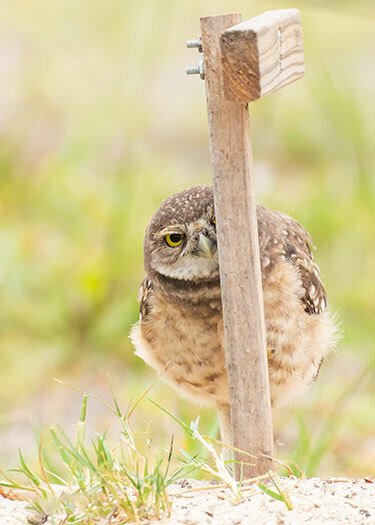 Want to help burrowing owl conservation and research? 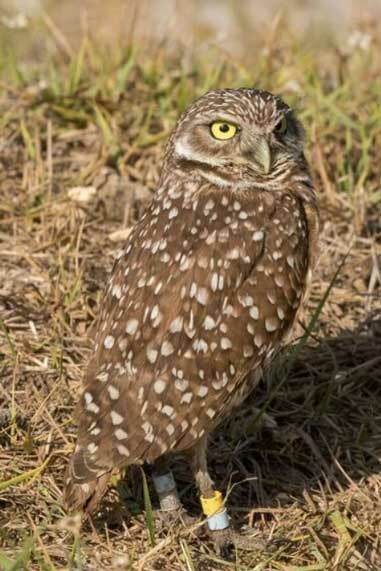 By symbolically adopting a Burrowing Owl or becoming an Owl Watch Patron Program, you can help fund critical needs of the Owl Watch program on Marco Island. Each season, Owl Watch needs funds to purchase materials for posting new burrows, hire trained professional landscapers to weed-wack postings, and buy supplies to continue our community outreach and education. 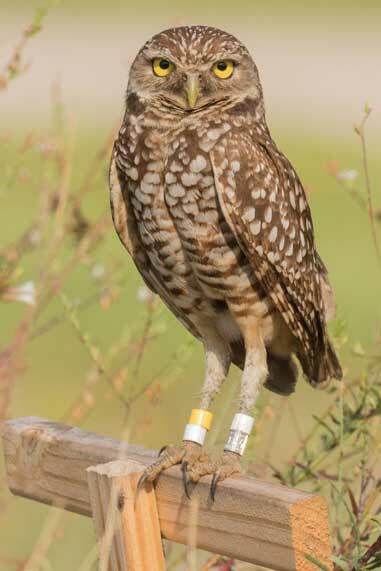 Click here to learn more about AWE’s Owl Watch Program and UF-IFAS’s Burrowing Owl research projects (page coming soon). You can adopt an owl at one of 4 different levels of support, or become a member of our Owl Watch Patron Program at 2 different levels of support. Depending on what level of support, when you adopt an owl you an receive an adoption certificate, your owl’s nesting season summary, fact sheet, photo of your adopted owl, and a stuffed owl puppet! And with our highest level of Patron support, you can name a newly banded owl, get a private tour to see Marco’s Burrowing Owls, and have lunch with a knowledgeable Audubon Staff member. Corporate sponsorships are also available. Potato was named by a young boy who decided both owls and potatoes were brown and lived underground. We whole-heatedly agreed, and Potato the owl was named! Potato might be shy, but he and his mate successfully raised 3 chicks in 2018–all with green eyes. Potato is a favorite of many here at Owl Watch. Seeing him always puts a smile on our face, and hopefully he will do the same for you! Piper is sponsored by The Coastal Breeze News, and is named in support of a girl living with cystic fibrosis. Piper the owl has lived a dramatic life: In 2017, she lost her mate, spnt time as a single mom, and lost her chicks to flooding. In 2018, Piper was relocated a mile away with a new mate and a new burrow. They successfully raised 3 chicks! We are hoping Piper has another great breeding season. The scientific name for burrowing owls is Athene cunicularia – named for Athena, the Greek goddess of wisdom, handicraft, and war. In mythology, the goddess Athena is often depicted with a small owl companion. Just like the goddess, Athena the owl is crafty and feisty! 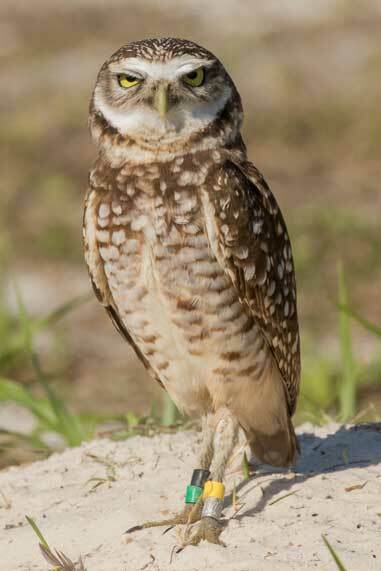 She was a strong mother to 5 chicks in 2018, above average for Burrowing Owls on Marco Island. Ollie and his mate had an interesting 2017 nesting season. After raising a successful brood, one of his adult sons decided to continue living at home that year. So Ollie and his mate to a new burrow across the street, and moved and raised a new family in 2018. Unlike other owls on Marco Island, Ollie prefers to decorate his burrow with big sticks and coconut husks. Why do researchers band owls? 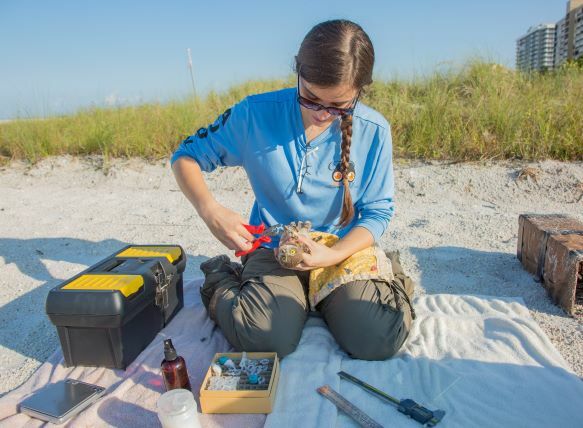 AWE has partnered with the Rangeland Wildlife Lab at the University of Florida (UF-IFAS) to learn more about the Burrowing Owls of Marco Island. 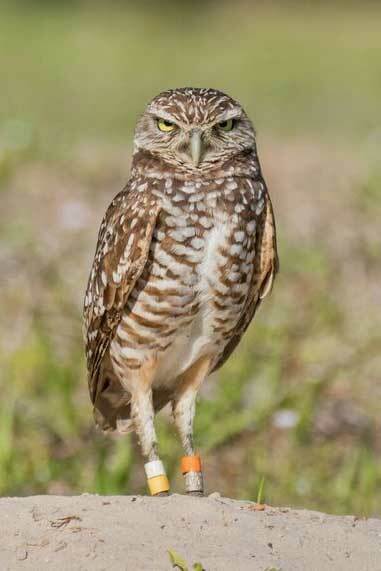 Burrowing Owls are being banded as part of a UF study across Southwest Florida. Each owl receives a unique combination of three plastic color bands and one metal band issued by the federal Bird Banding Laboratory at the U.S. Geological Survey (USGS). These bands allow researchers and volunteers to identify individual owls throughout nesting season and from year to year. Data collected from sightings of these banded owls are used to answer questions about Burrowing Owl lifespan, reproductive success, dispersal, and survival, which are essential to the conservation of this threatened species. Click to learn more about UF’s research (coming soon). $500 Package includes a symbolic certificate of adoption of a burrowing owl, burrowing owl fact sheet, 4x6 & 8x10 print of a burrowing owl, burrowing owl notecards, and special recognition on our website and in our Annual Report. $1,000 Package includes all of the above benefits PLUS you get to name a banded owl, you get a private owl tour for four people, and you get lunch with a knowledgeable Audubon Staff member to talk owls. These options are located in the Adopt An Owl section. Click on the Adopt button on any owl and choose your package. Collier County Audubon Society, Inc., d/b/a Audubon of the Western Everglades, is a 501(c)3 tax-exempt organization, IRS section 170c(iii) for both federal and state tax purposes. Federal tax identification number is 23-7030698. Collier County Audubon Society, Inc.’s, State of Florida Solicitation of Contributions Registration Number is CH17894. A copy of the official registration and financial information may be obtained from the Division of Consumer Services by calling toll-free 1-800-435-7352 within the State. Registration does not imply endorsement, approval, or recommendation by the state. These pages are designed and maintained by Collier County Audubon Society, Inc., © 2018 Collier County Audubon Society, Inc. The contents of this website, including all text, photographs and videos, are copyrighted material. No part of this website. No part of this page or site may be reproduced in whole or in part without the express written consent of Collier County Audubon Society, Inc.